You are here: Home » Family Stories » A Baby of Their Own! Against the odds – an Australian couple overcomes distance, time, and two battles against cancer to make their dream of having their own baby finally come true! Susi Gross and Paul Doyle met as two young first-year teachers in Australia. The couple married in 2004 with the dream of starting their own family right away. But that dream was shattered just a few months later when Susi got the devastating news that she had breast cancer and would need to undergo chemotherapy. A fertility expert wisely suggested they freeze several of the couples’ fertilized eggs – 11 little embryos they could implant following Susi’s cancer treatment. Just when it looked like Susi’s health was in the clear, and the couple could move ahead with plans to get pregnant -- lightning struck twice! Susi was diagnosed with a rare separate breast cancer, forcing her into another grueling round of chemotherapy. Several more years would pass before the couple could even try to conceive via invitro-fertilization. However, Susi’s body, worn down from so much chemotherapy, simply would not cooperate, and each implantation resulted in a negative pregnancy test. With only 11 embryos to work with, each failed attempt left the couple heartbroken. “It was so depressing to hear the news each time,” said Susi. “Here, we had survived cancer twice with the hope of having children, and it just wasn’t happening.” With only six embryos left, the couple discussed the idea of surrogacy, but because compensated surrogacy is illegal in Australia, they knew they would have to search for a surrogate in another country, which would increase the costs considerably. Now, with an actual due date, Paul and Susi had much to plan for -- including a long-distance trip to Las Vegas to witness the birth of their child – a little girl to be named Miriam. But baby Miriam apparently had plans of her own. 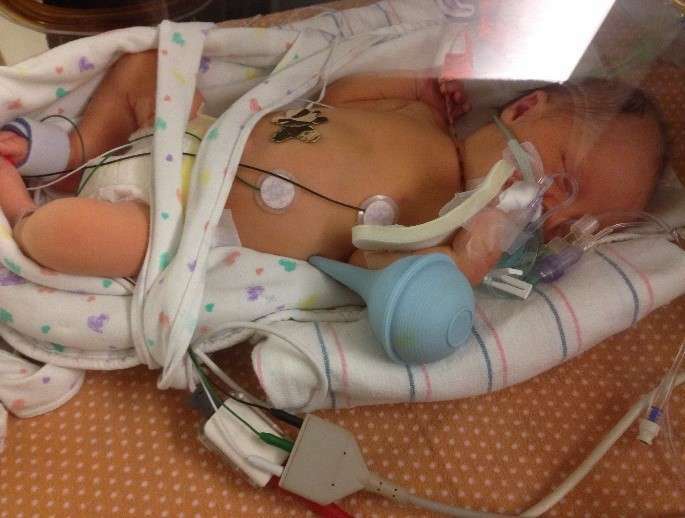 She decided to arrive six weeks early, just 34 weeks into the surrogate’s pregnancy. Two weeks before Christmas, Paul and Susi received a phone call from the woman carrying their child, letting them know she had gone into early labor – and the baby’s birth wouldn’t wait for Paul and Susi to catch the next flight to the United States the following morning. Fortunately, due to the marvels of modern technology, Paul and Susi witnessed the birth of their daughter live via SKYPE before packing their bags and heading to the airport. “It was the most amazing thing watching this little person we have longed to bring into the world for so long being born,” Susi said. “It was like falling in love all over again for the first time,” Paul added. 24 hours later, Paul and Susi were holding their daughter Miriam in their arms at the neonatal intensive care unit at Spring Valley Hospital in Las Vegas. And no one can deny the striking resemblance between mother and daughter. Knowing how far away from home these new parents were, a hospital social worker told Paul and Susi about the Ronald McDonald House, and they made a referral for the couple to stay at the House. And so, the day after Christmas, with their newborn daughter in their arms, the Doyle family walked through the doors of the Ronald McDonald House for the first time.